Whenever I'm given fresh flowers as a gift I'm always saddened that they rarely last more than a week. 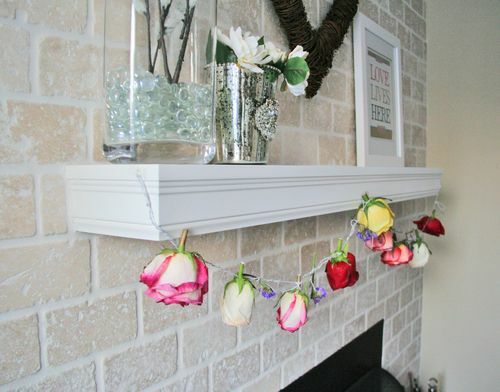 In an effort to preserve the flowers my hubby gave me I decided to make a fresh rose garland so I could enjoy them longer. 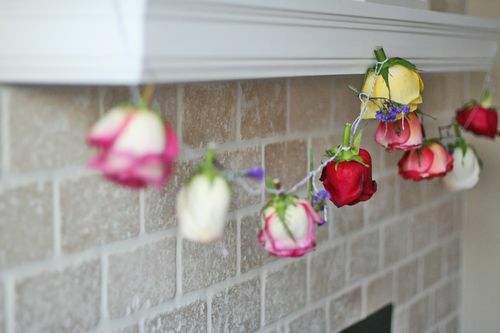 When the roses were almost fully opened and getting a bit droopy I followed these instructions. 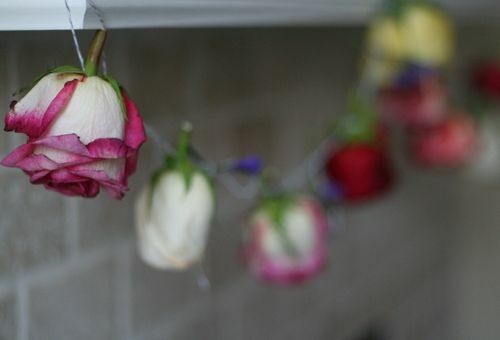 I had the garland made in about 10 minutes and up and hung in about 15. Not as vibrant but still quite pretty and charming. What a great idea! 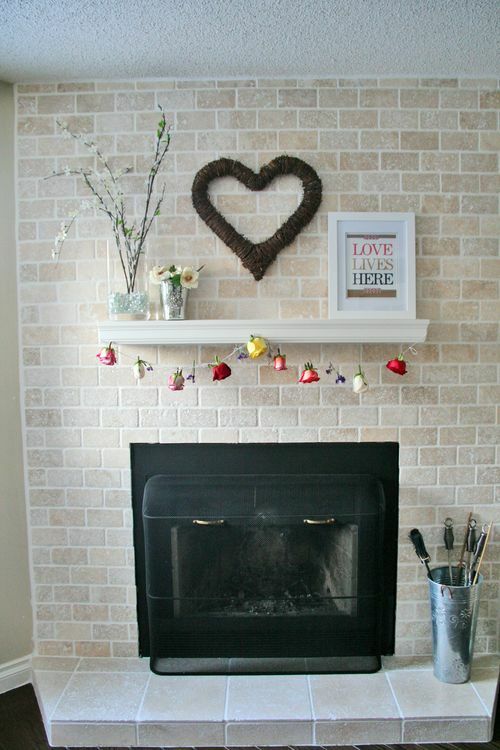 It looks so lovely above the fireplace. I feel the same way about having to throw out flowers. I always try make them last as long as possible by changing water and trimming their stems every day. It can seem a bit obsessive at times. 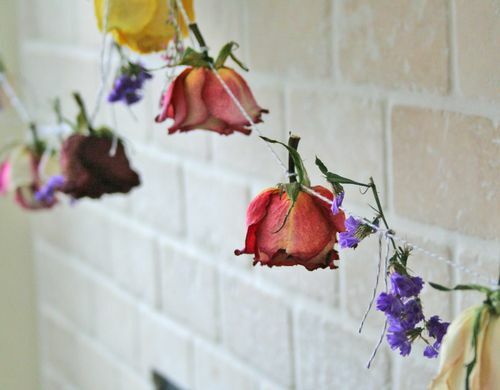 Years ago, when I was taking flower arrangement classes, I used to dry them and use them for all sorts of projects. Most of the things I used to make aren’t exactly in style anymore, but I sometimes miss the process of creating something. I also get nostalgic every time I walk past the dried flower section at a craft store. That smells that most people hate I happen to like quite a bit. I love that idea! I have never seen it before! 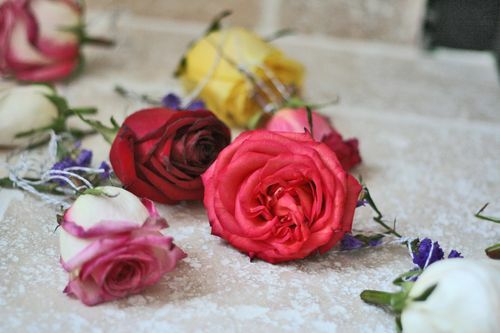 I really like that he gave you all shades of roses. I think it looks so good as a garland! Ah we really do need to have drinks one day Kristina. I have a feeling we have much in common. I too used to create all kinds of topiaries etc with dried flowers. One time when we lived in BC, in Victoria, I made my husband go on a late night hunt for lavender. LOL sad…I know. I am SO like you. I love the smell of dried flowers or an earthy smell or anything to do with flowers really. This is so crafty cool I can’t stand it! Get on it girlfriend! Especially when you had 7 dozen of them! 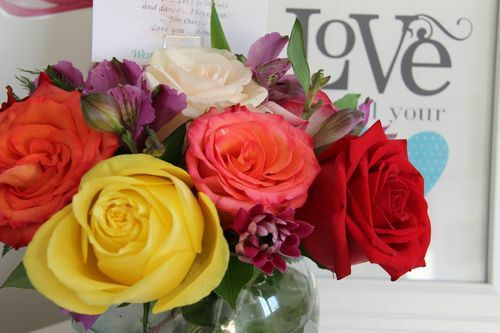 I didn´t get roses, but It can be done with other flowers. I shall let you know.